Users used to search for how to develop an app? What is native and hybrid application? Is it good to build a mobile website versus hybrid vs native app vs web apps? What is hybrid mobile app? Which is better native or hybrid app? Advantages and disadvantages of mobile apps? What is the difference between HTML5, Native app & a Hybrid app? Which is best hybrid or native? Which is most suitable for you and your mobile app development? In the field of web application development you as a html5 app developer, you require taking the time to think few considerations before beginning ionic hybrid application development or native apps building process. Your choice of a native or a hybrid app will depend on several contrasting factors including your budget, targeted audience, and your deadline. Both have their advantages and disadvantages so I have listed how to select if the app has to be a native app or a hybrid app. With the mobile app analytics; the very moment you decide to invest in a mobile app, you immediately come across loads of terminology. Terminologies like knowing the difference between iOS and Android? Determining the most trending mobile app development tools in Hybrid App Development platforms. Checking mobile application development platforms comparison information. Knowing what native, hybrid and web apps are? And very importantly, finding out which app is most suitable for you including web application development information? So, in this post, we’ll go over the differences between the two terms, which one to use, and make you aware of some of the benefits of each. 1. What is native mobile app? WHAT IS NATIVE APPLICATION — A native mobile application is a smartphone application program that has been created for use with a particular platform or device like for iOS, Android, Blackberry and so on. Native apps are encoded in a specific programming language, such as Objective C for iOS or Java especilly required for Android app development. Native mobile apps are fast and more efficient in performance. They also have access to the mobile device inbuilt features, like its camera, address book, GPS, accelerometer, the compass, the list of contacts etc. These are very well supported by the platform owners with specific libraries and support. One very unique factor about native apps is that users can use some apps without an internet connection. But note, this kind of app is expensive to build because it is generally designed to run on a particular operating system or specific devices such as IOS and Android. Examples of Native Apps: Majority of the well-known apps out there like a Facebook app, Twitter app, and Waze, are totally native. You may also like to know; Top 12 Reasons why business mobile app development is extremely important? 2. What is hybrid mobile app? HYBRID APP DEVELOPMENT — A hybrid app is created for use on multiple platforms (Android, iPhone, and Windows Phone smartphones.) They are web applications (or web pages) in the native browser, examples are 'UIWebView' in iOS and 'WebView' in Android (not Chrome or Safari). You can change mobile application development platforms anytime you need; Cordova allows you to build your application for more than one platform just by one adding the right line of code. Hybrid apps also have access to phone hardware (native functions) such as the camera, microphone, location and Bluetooth, Cordova has a large repository of plugins you can easily access that. Check the plugins library of PhoneGap here. 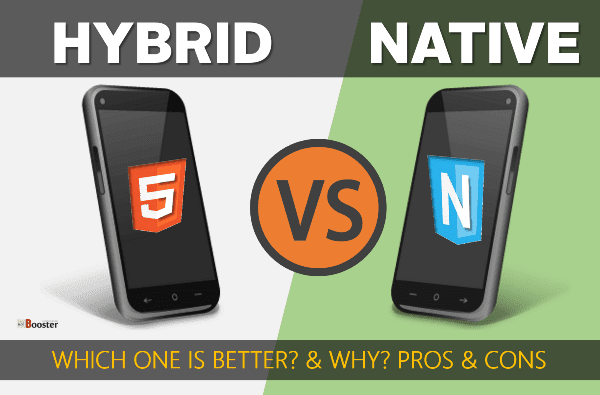 What is the difference between native and hybrid mobile application? The following table shows the native and hybrid app difference in very quick glance. 18. Integration Some device features may be harder to integrate into hybrid apps. The camera, address book, geolocation, and other features native to the device can be seamlessly integrated into native apps. Both native and hybrid apps are ways to meet different needs and purpose of users and app developer, and none of them can be said to be the perfect solution. These apps have their pros and cons both as an app developer or as an end user. So, you have to decide which of suits you better or which app is ideal for your business needs. 1. Full integration of Device. Native Apps are the apps which come up with a lot of functionalities offered by the mobile devices. For example, camera, GPS, calendar, microphone and much more. Native Apps help the users to build the experience which is fully enjoyable and provide great exposure. 2. Work without Internet Connection. The most important feature of Native Apps is that it also works without Internet connection. According to the functionalities, native apps can work without accessing the Internet. If you are looking for some high-speed application or game, then the native app is the way to choose. Native apps get designed or developed for some specific operating systems and they provide great performance. 4. Look and Feel of Native applications. The trendy look and feel of Native applications are eye-catching and inspiring, which allows users to connect easily and quickly to the icons and button. All the native apps, follow the specific UX/UI standards for creating Android or iOS applications, which allow the users to easily understand the interface and navigation of the apps. 6. More secure and safe. All the native apps of Android or iOS are only accessible through the app stores. Before all the apps get approved to be featured in the stores, they are fully tested and reviewed by the app store approval team. This provides a certificate of reliability and assurance. 1. Higher development and maintenance cost. Native apps are quite complex since they have a different codebase for each platform and to maintain them, it requires a lot of time and effort since separate teams have to maintain to work and support each version. 2. No guarantee that apps will get accepted. Once the applications are created, then it is required to get approval from the play store/app store. And it is a quite long and tedious process because all the applications have to get approved for the store to get featured. Also, there might be a possibility that the application might get rejected and not added to the App store databases. The principle advantage of hybrid apps arises from the fact that you are saving the stress of building two apps; you are building one app and tweaking it slightly so it works on both platforms that mean hybrid apps are the apps that offer unified development. Hybrid Apps allows the organizations/companies to save a huge amount of money. The developers can develop a single hybrid framework and the common code base can be used flawlessly for different platforms. 2. Only one Codebase to deal with. Hybrid apps are easier to maintain as you have to manage only one codebase. While developing hybrid apps, you require fewer app developers as compared to the native apps, which ensures smooth and efficient productivity. Hybrid apps can be developed easily without much efforts in a short period of time. It requires less maintenance as compared to native apps. Hybrid apps are flexible; they are easier to transform into another platform. By building one app on a platform, you can easily launch it on another. Hybrid apps are known as cross-platform applications which are easy to scale on different platforms and on different operating devices. It allows the development team to reuse the code without making many changes in the application. Hybrid apps support offline work, but while working offline data cannot be updated. In hybrid apps, users can easily load the application and access the previously loaded data. 6. Hybrid apps cost less. One of the unique qualities of the Hybrid app is that it uses web technology for app content, and this makes a building of hybrid app much easier. Web technology knowledge outweighs native app’s coding, so this provides more leverage for resources and you can save time and money. 7. Hybrid components are interactive. Visuals and interactive programs like games and 3D animation are present in hybrid apps, but these programs still work much better on full native apps. Businesses are not likely to have a more graphical and platform specific needs like games or animated apps, which is the main reason why hybrid apps are ideal for business professional services apps. Fortunately, more innovations are being introduced into hybrid apps on a daily basis and they have been catching up with their native cousins. Hybrid apps are a bit slower because they are based on the web technology and normally hybrid apps utilize the mobile platforms such as kendo, onsen, ionic, Cordova and much more. And all these platforms’ take considerable more time according to the application, which can result in loss of performance. It is one of the biggest flaws because if the user will not get an impressive experience, then the likelihood of the application becoming popular goes down. One of the critical disadvantages of a hybrid app is that they never provide a user the total native experience. And in the app domain, the user very rarely gives the apps a fifth or sixth chance. So, the UX has to be up there with the best and flawless. The hybrid apps still have some way to go before they catch up with their native cousins on the UX front. Now the question arises which one you should choose? Hybrid or Native app? To make the right choice it is important to understand the differences of each option so that you can go in the right direction. The Hybrid apps & Native applications each have their own strengths and weaknesses, and your final decision depends almost totally on your business requirements. Usually, Hybrid apps attract more because of their easy availability approach, cost savings and their compatibility with more technologies and platforms. All these things are very appealing but if we look at a longer term, then the hybrid apps can become a pain sometimes since they would need more time to fix the UX and performance issues which the users might report. Whereas, if we look at the Native apps, then these apps fully satisfy the users in terms of performance and with their seamless use of the platform’s inbuilt functions. It offers the best in class security for a mobile application, i.e., highly user interface design, best performance and access to the native API’s. However, native apps demand bigger investment in the beginning but if we look for the long run then it allows you to save your time and money in future by offering a better user experience and following the platform and industry standards. In the end, each organization has its own approach for designing an application, so it fully depends on you on which path to choose and follow. After considering your options, it's important to work with app developers that can give shape to your idea in an efficient and cost-effective manner. Subcontracting your app development is a good way to build your business without having to employ permanent in-house staff. Working with a professional outsourcing development team will enable you to navigate the uncharted territory of mobile app development smoothly. At now, I can help you to decide to choose the right app for your idea and needs. Article By Ashok Sharma - is a writer, professional blogger, Digital marketer and social media enthusiast. He currently hold the position of Digital Marketing Manager at GrayCell Technologies. He spends time in developing and executing online marketing strategies for clients of GCT.